The Internet is providing avenues for creativity in remarkably new ways. One that is recent and relevant to artists and connoisseurs as well as anyone who likes to do art travel (without the hassles) is The Virtual Paint out. 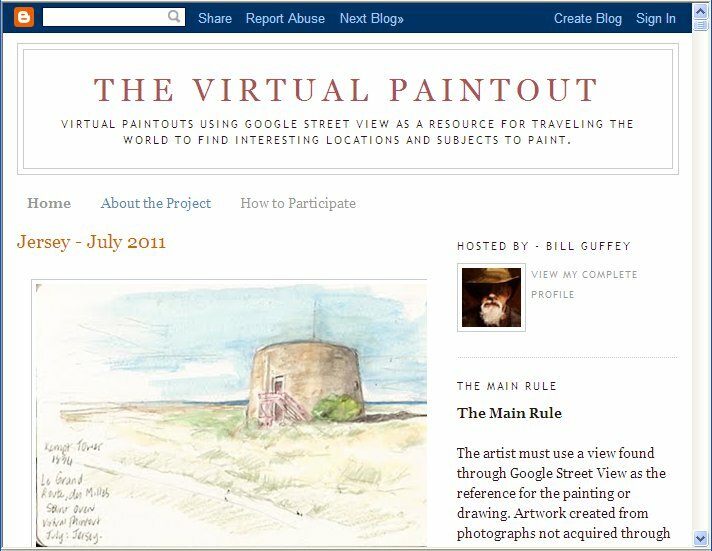 The self taught American painter Bill Guffy's innovation is based on Google's Street View. The idea is simple. Each month Bill identifies a location in Google maps. A location reasonably large and interesting enough to explore. He provides the details on the website on the 1st of every month. Artists around the world can log in, get the details, and go explore the location using Street view walk through. 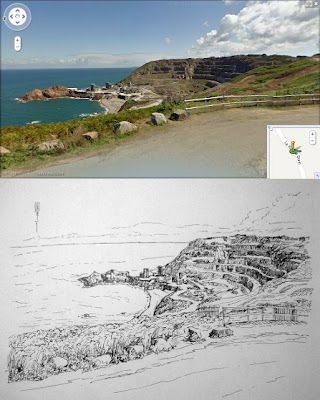 Then choose a location that they like, and make a painting/drawing/sketch of it and submit to Bill. What a way to explore a new place, and create new art.Here are the past locations explored by the Virtual Paint out artists. So far some amazing locations have be explored and its a treat to look at all the wonderful art that has been produced. Its a great new way to do virtual travel. One can pick a painting that is posted , look up the location and start exploring. Here is my attempt of a beautiful beach front in Jersey, using a vintage Hunt 512 and Pebeo Incre De Chine. This is a great and zero cost way of exploring the world in a new way, with the camaraderie of fellow artists. Hope you check out the site, and start travelling, painting and exploring. Thanks Bill for this lovely idea!